Today's Prompt: You wake up, it’s some day in the future, and your condition or (any health-related issue) has been cured. You heard right: cured. And you’ve been chosen to cover this breaking news. It’s your big break: write the Press Release, interview the cure-founder, or visit the discovery site where patients everywhere are flocking to get in line. This prompt is quite creative, but I'm not sure I can do it. I must admit that I'm having trouble with this prompt. When I hear the word "cure," there's a lot of emotional baggage that pops up. Those of us who've had D for a long time have been promised a cure for just as long. And as much as I want a cure, I can't bring myself to make light of it. I want it so badly some days it hurts. Most of the time, I'm ok with the fact that eating is complicated for me. Sometimes though, it hits me hard. Like last night, as we were watching TV, my husband sat there eating a giant bowl of ice cream. Could I go have some? Sure. But full-sugar, full-fat ice cream is not good for the bgs, no matter how precisely I measure. I don't remember what that feels like anymore. 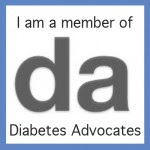 To be able to sit and eat whatever I want, and not worry about what it might do to my blood sugars. Today, that is hitting me especially hard. I don't know why. Poor J. He was sitting there, eating his ice cream, and his wife bursts into tears. And he was wonderful and supportive as always. I do want a cure. Desperately. But I try not to think about it too much, because honestly, I get upset when I do. Now, the Artificial Pancreas Project? I can talk about that all day. To me, that seems much more realistic. Something tangible that I can see happening in my lifetime. So, sorry everyone, there will be no witty press release from me today. If I do see a cure in my lifetime? Then there had better be D-prom, with glitter and the DOC mascot, Sprinkles the unicorn. Blunt Lancet will play, and there will be cupcakes galore. And I will dance the night away with my DOC friends. I know what you mean - not that I have D, but if they could 'cure' Pop's stroke, my herniated discs/osteo, Grandma's alzheimers, etc... Not something to be taken lightly. Have I mentioned how much I love J and his support (not to mention the wet shirts...) for you! You are one amazing lady! Don't give up on the cure. The artificial pancreas will help, but only as a crutch. There is plenty going on now in the biological research towards the cure. My islet cell transplant is not considered The Cure because of the immunosuppressive drugs I have to take. But it has taken away my low blood sugars and my fear for my future.